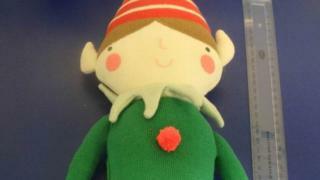 A batch of Christmas elf toys brought into the UK through Heathrow Airport have failed safety tests. Buckinghamshire and Surrey Trading Standards officers have ordered their removal from sale after tests showed they presented a choking hazard. A total of 96 elves had been imported to Surrey from an internet retailer in India. Surrey County Council said they had no link to official Elf on the Shelf products. The elf toys were checked during a routine inspection at a holding shed in Surrey. The council said decorations on the elves' hats and tunics could be torn off easily and therefore posed a hazard to young children. "The labels stated that the dolls shouldn't be given to under-threes, but in law all soft toys are automatically considered to be intended for small children," it said in a statement. Trading Standards officers have alerted their counterparts in Gloucestershire, where they say the internet retailer has offices. Denise Turner-Stewart, cabinet member for communities, said: "With the 'elf on the shelf' tradition becoming increasingly popular, this doll could have been in particular demand, but our officers picked up safety problems which could have led to children choking. "It's not unusual for Christmas toys to be passed off as novelties or decorations because they haven't been made childproof, and we would urge shoppers expecting young children in the house over the festive season to be on the lookout for products likely to be picked up and played with, despite labels saying they're unsuitable for under-threes."